Comic Con Revolution 2019: LAST CHANCE to Save! Early Bird Discount Ends Tonight! EARLY BIRD PRICING ENDS TONIGHT @ 11:59PM! Don't miss your chance to save up to 25% off the regular 2019 ticket prices. 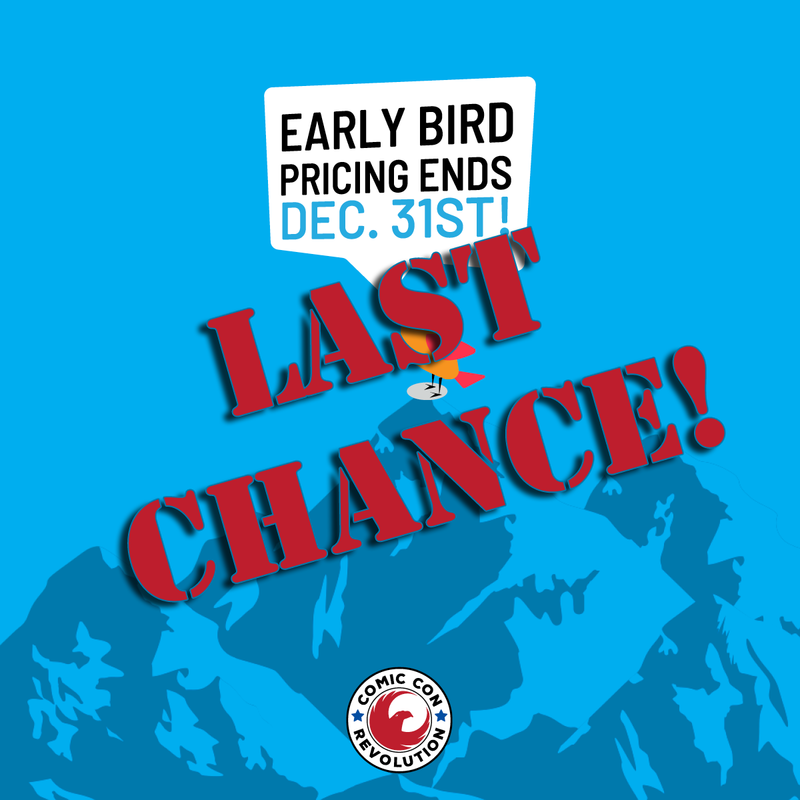 Get your CCR ticket order in before 11:59 pm PST and save big. Once the clock strikes midnight tonight the early bird pricing discount will be a thing of the past. Don't forget that ALL advanced ticket purchases include a limited edition Jetpack Jules art print as well as early admission each day. We've made getting you can have your badges even easier! You can have them mailed to you (in the spring of 2019) or you can pick them up at the show. AUTOGRAPH & PHOTO OP PACKAGE AVAILABLE! 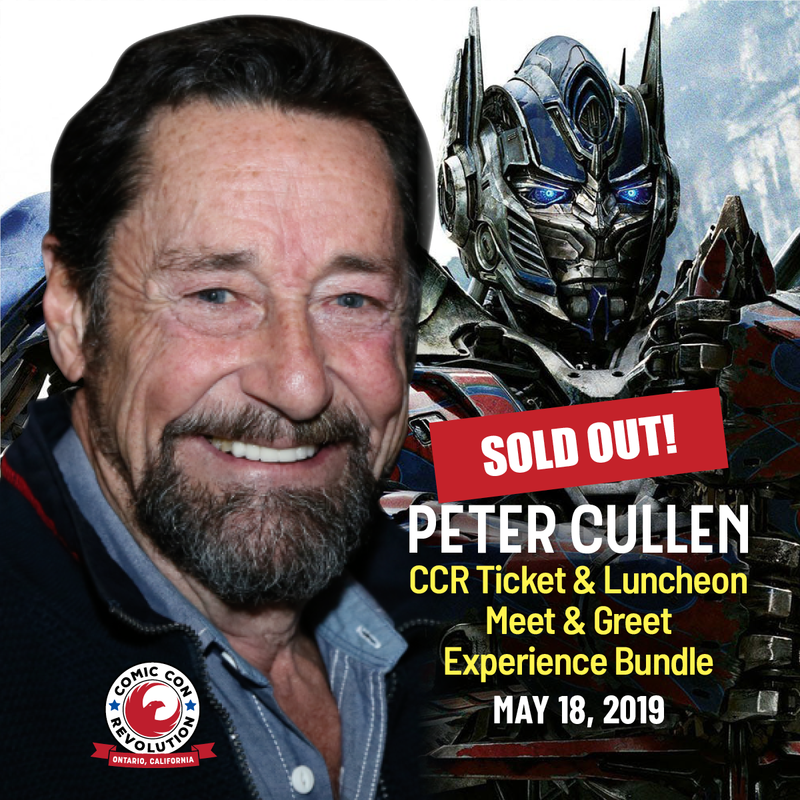 If you missed out on this opportunity also have available a limited number of Peter Cullen Autograph & Photo Package available. This package includes: One signature voucher, One photo op voucher, One limited edition print, One CCR pin. This package is strictly limited to no more than 200 total packages. Once we sell out, that's it, so get your package early. Comic Con Revolution 2019: 🕒 Early Bird Discount Ends December 31st! Order Tickets Now & Save! 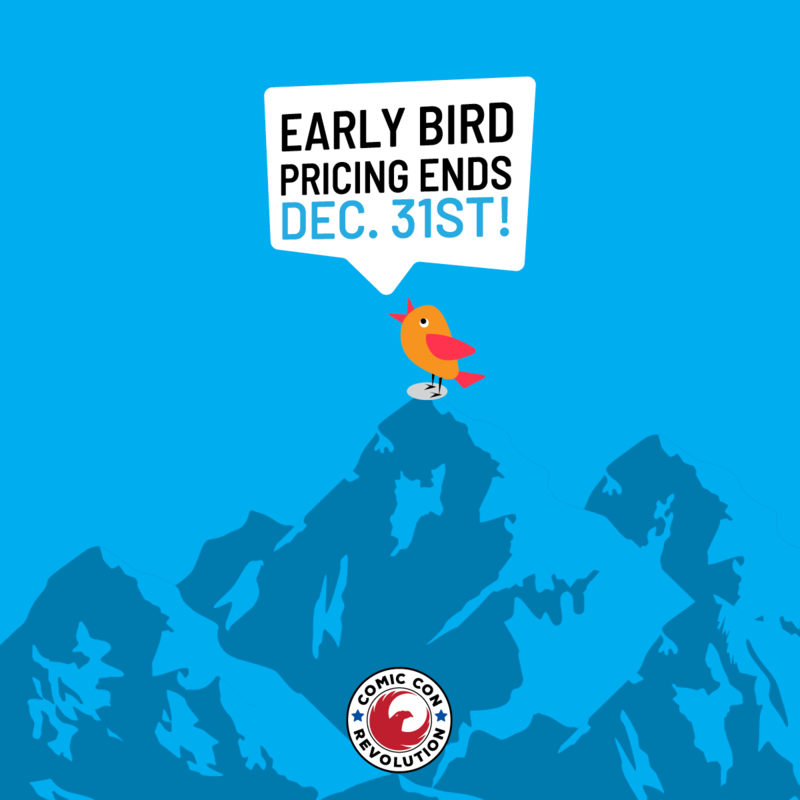 EARLY BIRD PRICING ENDS DECEMBER 31st! Come 12:00am PST on January 1st our early bird pricing discount, like 2018, will be a thing of the past! That's right, order your tickets before 11:59 pm PST in order and save up to 25% off the regular 2019 ticket prices. And don't forget ALL advanced ticket purchases include a limited edition Jetpack Jules art print as well as early admission each day. 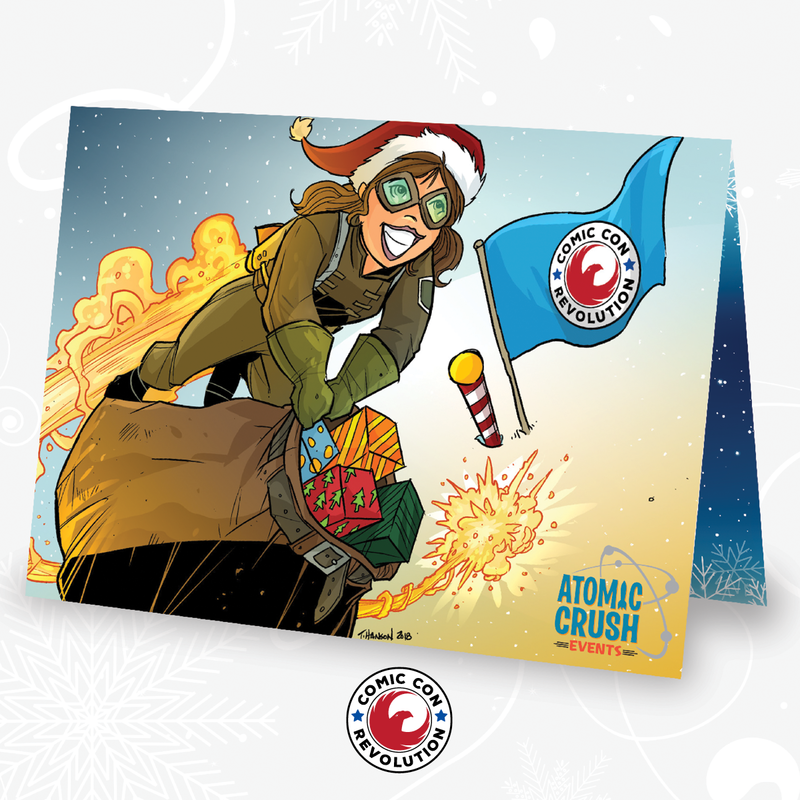 Did you know that Comic Con Revolution tickets make great holiday gifts? We make giving CCR tickets as a gift even easier by offering you a free printable holiday card featuring art by Travis Hanson. Just print, fold and fill it out! You can download the card here and grab somebody tickets by clicking the big red button below! This package includes: One signature voucher, One photo op voucher, One limited edition print, One CCR pin. This package can also be bundled with a ticket to show. These would make a great holiday gift idea for the Transformer fan in your life. We offer a downloadable Holiday Gift Card with art by Travis Hanson. December 20, 2018) Award-winning cartoonist Eric Powell’s Albatross Funnybooks will celebrate the 20th anniversary of the Goon with its first ever Free Comic Book Day title in 2019. 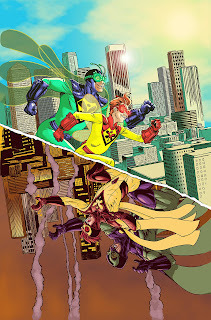 GRUMBLE VS THE GOON is a side-splitting, full color one shot co-written by Powell and Rafer Roberts and illustrated by Powell and BATTLE BUG creator Mike Norton. Here, for the first time ever, The Goon and his pal Franky will meet Tala and Eddie, from the pages of GRUMBLE, in an interdimensional adventure, chock full of death, mayhem... and dog catching. "I've been a huge fan of THE GOON for years, so this is still very surreal to me," said GRUMBLE co-creator and writer Rafer Roberts. "Working with Eric was an honor and a pleasure, and watching him and Mike jam on the artwork is a real thrill. I think we're creating something incredibly special that will satisfy GOON and GRUMBLE fans as well as entertain new readers. Honestly, I can't believe that we're giving this away for free!" “I’ve known Eric since before THE GOON existed. To be publishing GRUMBLE and doing a crossover with him is just an honor. It’s seriously some of the most fun I’ve had making comics!” said GRUMBLE co-creator and artist Mike Norton. In GRUMBLE VS THE GOON, Tala and Eddie think it might be a good idea to go dimension hopping when they find death incarnate hot on their heels. Unfortunately, things go from bad to worse when they land in the world of THE GOON. And Franky, the newly appointed dog catcher, don’t like talkin’ mutts that give him the sass! GRUMBLE VS THE GOON features a cover by Powell, and will be available at participating comic book stores on Free Comic Book Day, Saturday May 4th, 2019. The publication of GRUMBLE VS THE GOON is part of a year long celebration of The Goon’s 20th anniversary. The anniversary festivities kick off in earnest on March 13th, 2019, when Albatross Funnybooks will publish THE GOON issue 1, featuring all new stories. THE GOON #1 Standard Edition features an Eric Powell cover and will retail for $3.99. THE GOON #1 Special Edition features a cover by legendary artist Kevin Nowlan and will retail for $5.99. In the character’s debut with Albatross Funnybooks, Powell takes the series to its humor based roots as Goon & Franky return from strange adventures abroad to find a horde of unsavory characters who have filled the void left in their absence from Lonely Street. For this new run of stories, Powell will be joined on Albatross Funnybooks’ THE GOON by several acclaimed creators. About Albatross Exploding Funnybooks: Launched in 2002, Albatross Exploding Funnybooks has always been a labor of love for award-winning, Nashville-based cartoonist Eric Powell. The label began as a means to publish Powell’s creator-owned series THE GOON, which mainstream publishers had deemed “too different.” Although THE GOON later found a home and wider audience with Dark Horse Comics, Powell continued to publish, celebrate, and cultivate creator-owned titles through Albatross Exploding Funnybooks, including his all-ages comic CHIMICHANGA and Rebecca Sugar’s PUG DAVIS. In 2016, Powell rededicated himself in earnest to his publishing company, launching his new fantasy series HILLBILLY and other works such as the all-ages horror anthology SPOOK HOUSE, Fabian Rangel Jr. and Logan Faerber's weird war tale ’NAMWOLF and Brendon Small's GALAKTKON. Although he had been eking out a meager living in the comics field since 1995, Eric didn't find true success until he launched his critically acclaimed dark comedy series The Goon. The Goon was subsequently picked up by Dark Horse Comics and boasts a die-hard cult following. December 20, 2018) AHOY Comics—the startup publisher that pledged for readers to “expect more” from its line of comic book magazines in 2018— will publish its inaugural Free Comic Book Day issue in 2019. 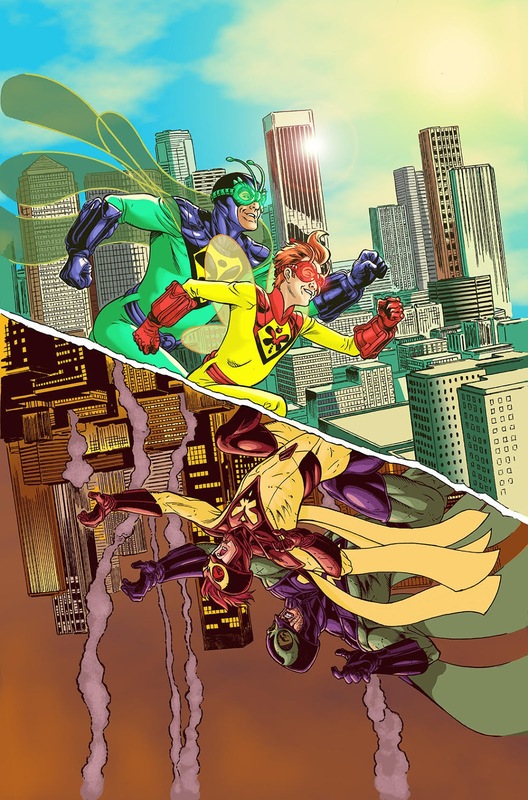 From the pages of the breakout hit comic book magazine THE WRONG EARTH by writer Tom Peyer and artists Jamal Igle and Juan Castro, comes DRAGONFLY & DRAGONFLYMAN by Peyer, artist Russ Braun and colorist Andy Troy. On gritty Earth-Omega, Dragonfly prowls the darkness for his evil prey; on sun-splashed Earth-Alpha, Dragonflyman protects the status quo. DRAGONFLY & DRAGONFLYMAN will be available at participating comic book stores on Free Comic Book Day, Saturday May 4th, 2019. A cover by WRONG EARTH artist Jamal Igle. Since its launch in May of 2018, AHOY Comics has been shaking up the publishing industry with a bold new format: comic book magazines. The startup company is the brainchild of Publisher Hart Seely, an award-winning reporter whose humor and satire has appeared in The New York Times and on National Public Radio; two original editors of DC Comics’ Vertigo imprint, Tom Peyer and Stuart Moore; and Chief Creative Officer Frank Cammuso. The comic book magazines feature traditional, full length comic book stories all accompanied by extra material, including prose fiction by writer Grant Morrison (Happy! ), cartoons by Shannon Wheeler (God is Disappointed In You), poems by Hart Seely (Bard of the Deal: The Poetry of Donald Trump), and traditional comic book back up stories. Timed to the release of DRAGONFLY & DRAGONFLYMAN #1, AHOY Comics will publish THE WRONG EARTH Volume 1 Trade Paperback, collecting the critically acclaimed lead stories, all the original back-features featuring Stinger, Dragonflyman & Dragonfly, plus a generous selection of AHOY text-feature extras, including a prose story by comics legend Grant Morrison: ‘HUD’ HORNET’S HOLIDAY IN HELL, illustrated by best-selling artist Rob Steen, and a cartoon by Shannon Wheeler. THE WRONG EARTH Volume 1 Trade Paperback will be available in comic book stores on May 1, 2019 and in bookstores later that month. June Brigman has enjoyed a long and varied career as a cartoonist, drawing such comic book titles as Alpha Flight, Supergirl, and Star Wars. She is the co-creator (with Louise Simonson) of the Power Pack series from Marvel Comics, which recently celebrated its 30th anniversary. Assisted by her husband inker/colorist Roy Richardson, she illustrated the Brenda Starr comic strip for 15 years, and has drawn many educational comics, as well as doing freelance illustrations for Horse & Rider magazine. June and Roy also draw the long-running “Mary Worth” comic strip. Her online portfolio can be seen at www.ArtWanted.com/juneart. Frank Cammuso is the author/illustrator of the graphic novel series The Misadventures of Salem Hyde from Amulet Books. He also created the graphic novel series Knights of the Lunch Table from Graphix/Scholastic. Frank drew the comic Otto’s Orange Day and Otto’s Backwards Day for Toon-Books. He also wrote and drew his self-published graphic novel Max Hamm Fairy Tale Detective, for which he received an Eisner nomination. Frank is the former award-winning political cartoonist for The Post-Standard newspaper in Syracuse, NY. His cartoons have been reprinted in The New York Times, The Washington Post, USA Today and Newsweek. He has written fiction and satire with his good friend Hart Seely. Their work has appeared in The New Yorker, The New York Times, The Village Voice, Slate, and on National Public Radio. He’s the co-author of 2007-Eleven and Other American Comedies. Paul Constant is a co-founder of The Seattle Review of Books. He has written for The Progressive, Newsweek, Re/Code, the Utne Reader, the Los Angeles Times, the Seattle Times, the New York Observer, and many North American alternative weeklies. Paul has worked in the book business for two decades, starting as a bookseller (originally at Borders Books and Music, then at Boston’s grand old Brattle Bookshop and Seattle’s own Elliott Bay Book Company) and then becoming a literary critic. Formerly the books editor for the Stranger, Paul is now a fellow at Civic Ventures, a public policy incubator based out of Seattle. Veronica Gandini's color work has appeared in books from DC Entertainment, Marvel, Image Comics, BOOM! Studios, Arcana, Ape Entertainment, and Atlantis Studios. Jamal Igle is a recipient of the 2011 Inkpot Award for outstanding achievement in Comic Art, industry veteran Jamal Igle is the writer/artist/creator of Molly Danger for Action Lab Entertainment; the co-creator of Venture with writer Jay Faerber; and the artist of the series Black from Black Mask Studios. Jamal's detailed pencils have graced books as varied as The Narrative of the Life of Frederick Douglass, the all-ages action miniseries Race Against Time, and mainstream hits such as G.I.Joe, Iron Man, Spider- Man and Green Lantern. Jamal has penciled popular runs on Firestorm the Nuclear Man, Nightwing, Tangent: Superman's Reign, Superman, Supergirl,and Zatanna for DC Comics; Noble Causesfor Image Comics; and New Warriors for Marvel Comics. He's acted on the small screen, done voiceovers for commercials, packaged books for Scholastic, and drawn storyboards for Roughnecks: Starship Trooper Chronicles and Max Steel: MX1 for Sony Animation. Jamal is also a popular guest lecturer on the subjects of comics and animation. Todd Klein’s comics career began in 1977 when he was hired to work in the DC Comics production department. During ten years on staff there, Todd tried many kinds of freelance work including writing (Tales of the Green Lantern Corps, The Omega Men), inking and coloring, but found lettering suited him best, and developed a freelance career as a letterer and logo designer. Todd learned from and was inspired by the work of Gaspar Saladino, John Workman, John Costanza, Tom Orzechowski, and other letterers then working in comics. After leaving staff in 1987, Todd continued to work mainly for DC, but also for Marvel, Dark Horse, Disney, Gladstone, Image and many other companies, doing lettering and logo designs. Through the years he’s lettered over 65,000 comics pages and covers and designed over 800 logos. Todd has been presented with 16 Eisner Awards for Best Lettering, as well as 8 Harvey Awards and other honors. Recent projects include Sandman Overture with Neil Gaiman and J.H. Williams III, Starstruck with Elaine Lee and Michael Wm. Kaluta, The League of Extraordinary Gentlemen with Alan Moore and Kevin O’Neill, and logos for AHOY Comics' THE WRONG EARTH, HIGH HEAVEN, HASHTAG: DANGER, CAPTAIN GINGER, and EDGAR ALLAN POE'S SNIFTER OF TERROR. You can learn more at his website: kleinletters.com. Stuart Moore is a writer, a book editor, and an award-winning comics editor. His recent comics writing includes Deadpool the Duck (Marvel), Batman: Noir Alley (DC/Turner Classic Movies), and EGOs (Image). Recent novels include three volumes of The Zodiac Legacy, a Disney series created and cowritten by Stan Lee, and Thanos: Death Sentence (Marvel). Other comics work includes Wolverine Noir and Namor: The First Mutant (Marvel); Supergirl/Jesse Quick: The Fastest Women Alive and Firestorm (DC Comics); assorted Star Trek and Transformers projects; and the original science-fiction graphic novels Earthlight, PARA, Shadrach Stone, and Mandala. Prose writing includes the novel version of Marvel’s Civil War and John Carter: The Movie Novelization. Stuart has also served as freelance editor of Marvel Comics’ prose novel line. In the past, he has been a book editor at St. Martin’s Press and editor of the Virgin Comics / SciFi Channel and Marvel Knights comics imprints. At DC Comics, he was an original editor of the acclaimed Vertigo imprint, where he won both the Will Eisner award for Best Editor and the Don Thompson Award for Favorite Editor. Tom Peyer was a long-running writer on DC's Legion of Super-Heroes, an original editor at their Vertigo imprint, and the proud writer of their worst-selling, award-losing series Hourman. He has since written enough major characters to fill one of those hyper-populated superhero posters where you don't know who to look at first. Today he happily writes and edits AHOY Comics from his Ditkoesque office in Downtown Syracuse, NY. Roy Richardson was inspired to pursue a comics career by the work of Jack Kirby, the ground breaking Fourth World series in particular. He has worked for all the major publishers, on such books as Captain America, Iron Man, the Flash, Star Wars, and his own co-creation, the Tomorrow Knights, which has been adapted into a roleplaying game from ZMan Games. He also worked for 15 years in collaboration with his wife, June Brigman, inking, lettering and coloring the Brenda Starr comic strip. The pair have recently taken over the artistic reins of the long-running Mary Worth comic strip. Roy is also hard at work on his first book of short stories, entitled "Hillbillies Prefer Blondes," tales of growing up in the South in the 1970's. His online portfolio can be seen at www.ArtWanted.com/royart. Hart Seely is a former award-winning reporter and author. His humor and satire have appeared in The New Yorker, The New York Times, McSweeney’s, National Lampoon, Politico and on National Public Radio. He is the editor of three collections of “found poetry;” Pieces of Intelligence: The Existential Poetry of Donald H. Rumsfeld, Bard of the Deal: The Poetry of Donald Trump and (with Tom Peyer) O Holy Cow! The Selected Verse of Phil Rizzuto. Seely lives in Syracuse, New York. Andy Troy has colored for Marvel Comics, DC Comics, Extreme Studios, and others, working on such characters as Spawn, Batman, Captain America and Iron Fist. He lives and works in Hunsville, AL, where he used to play in the metal band Diamond White. Shannon Wheeler is an American cartoonist known for his contributions to The New Yorker and his satirical super-hero Too Much Coffee Man.